On November 27 on the main stage of the country, at the State Kremlin Palace, the audience will see the gala concert of the World ballet stars entitled “Maya Plisetskaya. Dedication” This concert is a part of Andris Liepa’s new annual project “Autographs and Images”. The brightest ballet stars and soloists of the most renown theaters will gather to honor the memory of the Prima Ballerina Assoluta Maya Plisetskaya. 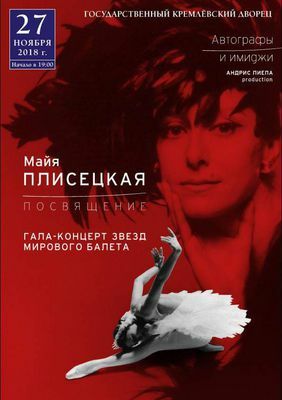 The program includes ballet scenes that served as name cards to Plisetskaya, where she could reveal with the special clarity her artistry and technical skills. Together with fragments from ballets of the Bolshoi Theater classical repertoire, the masterpieces of choreography of the 20th and 21st centuries, created specially for the great Maya Plisetskaya will be shown together with a rare documentary footage from the life of the legendary ballerina. Andris Liepa is the permanent organizer and director of gala concerts around the world dedicated to Maya Plisetskaya.